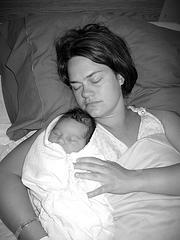 Sometimes called the “family bed”, the concept of co-sleeping is sleeping with baby and parent in the same bed. It is practiced widely by parents who consider it a form of attachment parenting -- a way to keep their babies close at all times -- in hope that the baby will feel secure and have his needs met quickly. For others, it is a matter of convenience to have baby within arm's reach. Co-sleeper advocates believe that babies and mothers sleep better and longer; breastfeeding is easier; and parents and infants become more connected. The Academy of Pediatrics does not recommend co-sleeping. Generally, there is concern that it may lead to increased risk of SIDS or suffocation due to excess bedding. If you choose to have your baby in bed with you, take steps to prevent baby from rolling out of bed. You may consider using a guardrail or placing the mattress flush will the wall and positioning your baby between yourself and the wall or guardrail. Guardrails enclosed with mesh are safer than those with slats. Be careful that there is no space between the mattress and wall or guardrail for baby to fall into. A Co-Sleeper Crib is an option that some people choose. It is an infant bed that attaches to an adult bed. These make it easy for a mother to lie in bed and nurse her baby while not worrying about her baby accidentally rolling over from the weight of the parents in bed. The baby and parents each have their own separate sleeping area, yet they are within an arm’s reach for nighttime care. It should be noted that no safety standards have been established and they are not subject to mandatory safety standards. Alternatively, some people choose to place the full size baby crib in the parents’ room. Sharing your bedroom for your baby's first 6 months is recommended. If there's no room in your bedroom for your baby's crib, a bassinet or cradle will do. Keep in mind that bassinets and cradles don't last long. By 4 months or so, your baby will probably outgrow it. Many parents choose to sleep with their babies. It can be done safely if precautions are taken.